Download the full program now. Registrations: 12 noon – 4pm Sails Hotel – collect name tags and conference satchels. 8.30am-5.30pm: Conference Sessions, Sails Hotel, Port Macquarie. Evening free for delegates to dine and mingle. Professor, The Hon Dame Marie Bashir, AD, CVO, Patron of the Australian Centre for Arts and Health and a staunch advocate of arts, health and creative ageing. Alice Thwaite, Co-Director, Equal Arts, Newcastle Gateshead UK. International expert in creative ageing programs, artists in healthcare’ training, arts on prescription and innovative creative age ideas (presented 2011, 2013). Dr Persephone Sextou, Reader in Applied Theatre, Newman University Birmingham UK – Leading expert in Theatre for Children in Hospitals (TCH). Persephone will profile the impact of intimate theatre performance on children’s hospital and hospice experiences in the UK (sponsored by Griffith University, Queensland). Anne Gallacher, Director, Luminate, Scotland’s creative ageing organisation and founding director of the Luminate creative ageing festival, established 2012. Elaine Burke, Advisor, UK National Health Services’ Hospitals Arts Strategy; Hull UK City of Culture 2017; “Larkin with Toads” public art project (presented 2012). Dominic Campbell, C0Founder & Producer, Creative Ageing International and former artistic director, Bealtaine creative ageing festival, Ireland (presented 2013, 2015, 2016). Dr Anna Goulding, Research Associate, Institute of Health and Society, Newcastle University, UK. Co-editor of Resilience and Ageing: Culture, Creativity and Community, Policy Press UK, November 2018 (presented 2014, 2015). Mary Robson, Research Associate (Creative Facilitator), Institute for Medical Humanities, Durham University, UK. Key projects include Hearing the Voice and Life of Breath (presented 2010). Mary worked closely with Mike White (1944 – 2015), a luminary in the arts and health field internationally. Mike worked with Margret Meagher in the development of this conference from 2006 and Mike attended all conferences until his untimely death in 2015. Mary Robson will present the 2018 Mike White Memorial Lecture. Arts OutWest: An Innovator in Arts and Health – Since 2008, Regional Arts NSW organisation Arts OutWest (AOW), based in Bathurst and covering central western NSW, has been committed to running an Arts and Health program. Tracy (a musician) and Christine (a visual artist) have worked in hospitals, aged care facilities, with community groups and community health. A highly instructional workshop for health professionals and Local Health Districts (LHD) to learn how to design, implement, manage and evaluate an arts program in healthcare. The presentation looks at the Lachlan Health Service (LHS) Culture and Arts program, associated with the redevelopment of the Forbes and Parkes hospitals and their award winning LHS Signage project incorporating Wiridjuri signage and translations. We Do Not Even Give Space to the Fear: Healthcare Professionals’ Reactions upon Viewing Patients’ Drawings of Their Asthma Experience – Art provides an insightful opportunity to gain awareness and sensitivity to the patient perspective in healthcare. Melissa is a practicing pharmacist interested in patient experiences of chronic conditions. Her research explores patients’ and healthcare professionals’ perspectives of asthma though the medium of drawings. It is not uncommon for each to have contrasting views about health and illness, which can influence communication, rapport, treatment and consequently clinical and psychosocial outcomes. Overall, healthcare professionals found viewing patients’ drawing of the asthma simultaneously confronting and eye-opening. How Naruto Helped Me Understand the Conversational Model: an Example of Graphic Medicine – Mental illness and the consequent treatment is complex, and the communication of that complexity among psychotherapeutic professionals can be difficult – even more so for the lay person. ‘Graphic medicine’ has recently been introduced into the medical literature and refers to the use of comics/graphic novels as a medium to facilitate the understanding of medical information. Art Therapy in Palliative Care – Adele utilises her life skills and background in the visual arts to provide palliative care unit patients with customised arts programs. This presentation will be co-presented by Ann Bodill, Executive Officer and Director of Nursing, Wauchope District Memorial Hospital, Port Macquarie-Hastings, NSW. Reading ‘Ned Kelly’ on a London Hospital Stroke Ward – May was Stroke Awareness Month in the UK. Award-winning charity InterAct Stroke Support asked their professionally trained actors to record a favourite story, regularly performed in hospitals and stroke clubs. A Londoner, born of Australian parents, Rose is a UK based performer-writer and arts and health practitioner who has been working in stroke recovery for 12 years at London’s National Hospital for Neurology and Neurosurgery. Combining Creativity And Culture: An Insight into the Impact of the Starlight Children’s Foundation’s Indigenous Artist in Residence Hospital Project – Starlight delivers programs to hospitalised children and adolescents, using art and creativity as a cornerstone in their approach to promoting wellbeing and resilience. Picture Power: A Photovoice program – to support the ongoing social participation for people living with a progressive neurological disease (PND). This relates to a 2 year pilot implemented as part of a neuropalliative healthcare service for adults with progressive neurological disease such as Moto Neurone Disease and Huntington’s Disease. Enhancing Psychological Health through Art – Skills-sharing experiential workshop to explore how to stimulate creative thinking when using art activity projects with children, adolescents, families and couples dealing with relationships, grief, trauma, conflict and self-reflection. RED Resilience Liz Lea shares the story of her new dance theatre work RED – a critically acclaimed one-woman show which explores her experiences with Endometriosis. Liz details how her dance career gave her the resilience to work through her symptoms, how these factors contributed to a worsening of the condition and hr subsequent journey back to health and a different form of resilience. 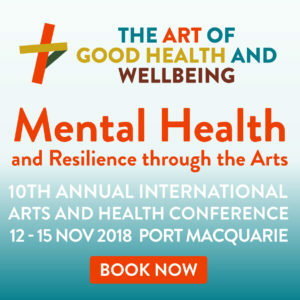 Arts in Healthcare: Developing and Sustaining Services – This workshop aims to answer the question – what can the arts in healthcare achieve, and how can health leaders and managers develop Arts and Health projects, programs and services that achieve their aims and are sustainable in the longer term? Elaine Burke developed the UK’s first NHS (National Health Services) arts and health service, to respond to specific healthcare issues such as suicide prevention, first episode psychosis, learning disabilities, mental health. Elaine also led several healthcare environment and design projects. 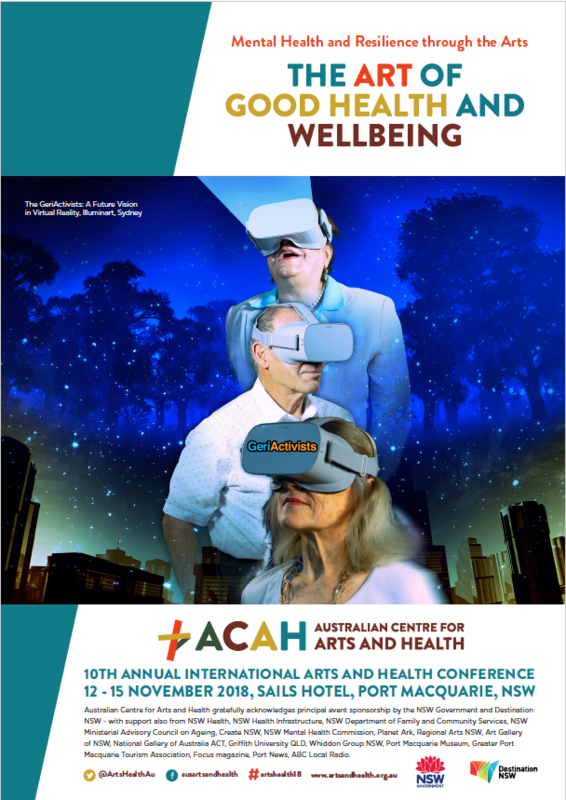 Creating Wellbeing, Creativity and Resilience through the Arts in a Remote Aboriginal Community in the APY Lands South Australia – This presentation demonstrates the power of art in promoting wellbeing, creativity and resilience in a remote indigenous community. JACKIE JACKSON, MANAGER, ABORIGINAL HEALTH, SOUTHERN NSW LOCAL HEALTH DISTRICT, MORUYA, NSW – Wangganga Arts as Therapy Group – Wangganga Arts Therapy group provides a culturally appropriate women’s health service using a holistic health care approach, where Aboriginal women come together in a community setting with Aboriginal health workers to engage in an Arts as Therapy group setting. Outcomes include healthier eating choices, smoking cessation education, skills development to overcome change and engagement with physical exercise, within a culturally safe and welcoming environment. Head, Heart and Hands: Reconstructing Resilience in the Rural & Remote Health Workforce – All health professionals in the remote context face unique occupational stress challenges. This presentation explores the results of an innovative collaboration between Positive Psychology as a framework and the principles of Mindfulness, Emotional and Somatic Awareness through art therapy. CranaplusBush Support Services provides support and intervention to remote area health professionals, to counter occupational stress, burnout and trauma and understanding the importance of offering creativity that crosses cultural boundaries. Theatre for Children in Hospital – Intimate storytelling performance with puppets to improve children’s experience of illness in hospital, including child participation, relocation, interaction, emotional and social wellbeing and engagement with hospital tuition. Mindfulness + Art Therapy = Colourful Calm – Combining Mindfulness Meditation and MeCards, Health promotion professionals Andrea Farley and Kerrilee Kimber have developed an innovative approach to reducing stress and anxiety in schools. This has proved beneficial for both staff and students and led to a shirt in school culture that recognises the importance of a healthy body and mind. Making art, mindfulness in action – The Heart to Heart is a school based program that changes lives through an art-based mindfulness practice, connection to others and sharing the magic of creativity. It has been running in the Great Lakes NSW for nine years and includes a research collaboration with Macquarie University in Sydney. Picture Power: Participatory Photography Workshop – This workshop introduces participants to steps involved in designing and delivering a Photovoice photography project for schools, relating to the theme of the conference and revealing participants priorities, attitudes and issues. Arts Therapy: What Is It? – An explanation of Arts Therapy, its advantages, where it’s found, history, professional training standards for therapists and the evidence base. This presentation provides an introduction to ANZACATA (Australian, New Zealand and Asian Creative Arts Therapy Association), the peak body for professionally registered Arts Therapists. Making Recovery Fun and Funky – Programs that engage and stimulate, inspire and remotivate are at the heart of the Port Macquarie Community College program, including The Recovery College project. Te Ara Auaha – Towards Creativity: Arts and Youth Wellbeing in Aotearoa, New Zealand – This University of Auckland research project is designed to generate better understanding of arts in and for youth health and wellbeing in Aotearoa, New Zealand. The new Government has declared a commitment to the arts and its role in wellbeing and Creative NZ, the Arts Council of New Zealand Toi Aotearoa (“Land of the Long White Cloud”). The University of Auckland is working with an alliance of arts, health and youth organisations and practitioners to establish an inter-disciplinary innovation hub for arts and wellbeing practice. Aesthetic Nervousness and Embodied Difference – artists lived experience of mental illness and acts of aesthetic engagement. The arts build individual resilience and mental wellbeing and help people express experiences that are too difficult to put into words. The unique stories of the lives of people with mental illness have the potential to move, provoke, educate and entertain and open new dialogues about inclusive artistic practice. National Arts and Disability Strategy 2019 – Established in 2017, Cultural Ministers agreed to renew the Strategy for 2019 and build an evidence base, commencing with the release of a Research Overview of Arts and Disability in Australia. This examines the different ways people with disability engage in the arts: as creative and cultural professionals, as audience members and consumers of cultural products. The Research Overview brings together and existing and previously unpublished data, academic research and case studies from around the country, exploring success factors and barriers for people with a disability in the arts sector and health and wellbeing outcomes. Mahlie is a stroke survivor, brain injury, social justice and mental health advocate as well as a qualified counsellor, Intentional Peer Support worker and graphic artist. Mahlie will share her lived experience of acute and severe PTSD, Borderline Personality Disorder and psychosis and describe the role that art plays in the therapeutic environment to unlock and heal trauma and build strong relationships with clinical staff. “The pencil that saved my life” explores Mahlie’s recovery from over two decades of self-harm, drug and alcohol dependence, violence and suicide attempts and celebrates the arts’ pivotal role in her ongoing recovery and wellbeing, four years clean and sober. Far from the Maddening Crowd – Revisited – a study about individuals with a diagnosis of Asperger’s syndrome (DSM 5 Autism Level 1) and how they form and develop their sense of identity. The research found that during times of sensory overload, individuals with autism self-directed towards art-based activities such as writing poetry, play a musical instrument and drawing, in order to regain a sense of balance. Participants withdrew – retreated, recalibrated their sensory overload and then recovered. Poetry at the Crossroads: More than Just Words – This presentation aims to provide a vision for poetry, journaling and the act of writing that brings it to the heart of Arts and Health consciousness as both a preventative and restorative tool for wellbeing and joy. How Creative Thinking Influences Positive and Negative Affect – Shared Threads brings people together over shared craft projects and conversation to build community and improved wellbeing using Martin Seligman’s PERMA model of wellbeing, demonstrating the benefits of craft as therapy. Artificial Intelligence and Its Relationship with Human Meaning in Images – In a world first, humanistic artificial intelligence can now understand human meaning, emotion and the relationship that people have to their digital image collections. ‘Sortal’ is a learning personal assistant that can sort and manage personal visual information, while still placing people central to their experience. Enlivenment – Enlivenment is a one hour psycho-physical workout designed to refresh the tired mind. Trained as an actor and psychiatric nurse, with a long history as a drama teacher, Ken has worked at USPACE, the young adult mental health unit at St Vincent’s Private Hospital, for the past six years. Addressing Mental Health Problems in the Australian Entertainment Industry. Australian entertainment industry professionals have substantially higher levels of mental health problems and suicidal ideation than the general population. Amy is currently working as part of the Mental Health and Research team on a partnership with Entertainment Assist. With 25 years in the field, Alice is a world leader in creative ageing programs, skills training and arts on prescription models. Equal Arts has been working with over 50 arts venues and organisations in the UK and Europe to inspire and support Creative Age sessions, hosted with cultural venues, are artist led, inclusive, friendly and involving the wider community, particularly children and families and changing the narrative around dementia. Creative Age Challenges is one of three flagship Equal Arts programs, with also includes Hen Power and Creative Friends. DOMINIC CAMPBELL, CO-FOUNDER & PRODUCER, CREATIVE AGEING INTERNATIONAL; FORMERLY ARTISTIC DIRECTOR, BEALTAINE CREATIVE AGEING FESTIVAL, IRELAND. Presentation: What is the role of creative practice in response to the social and health impacts of demographic change? Workshop: Start your creative ageing festival now. The ambition of this session is that participants lead a creative ageing event within a year. Broadening the Horizon –A great barrier for older Australians to accessing/maintaining leisure pursuits and hobbies is transportation, especially for those in aged care. The GeriActivists: a Future Vision in Virtual Reality – The GeriActivists is an iterative investigation in cultural futuring with Seniors from St Marys, in Sydney’s western suburbs, an area characterised by high socio-economic disadvantage. Can community arts and cultural development help Seniors feel less anxious about financial, cultural or environmental disruption? GeriActivists connects people, as players or as spectators, with professional multi media practitioners and technologists and places local people’s stories onto a public canvas, outside the traditional gallery or performance spaces and invites engagement with ideas in surprising and inspirational ways. The Luminate Story – Luminate, Scotland’s creative ageing organisation, aims to ensure that older people across Scotland have access to high quality arts and creative activities, whatever their circumstances and wherever they live. But should we really need specialist creative ageing organisations? What will it take to ensure that creative programmes with and for older people are embedded in cultural programming and are seen as vital to health and care provision? Anne’s presentation will tell Luminate’s story, from its launch as an annual creative ageing festival in 2012 to its new beginnings in 2018 as a year-round development organisation with a biennial festival. Understanding and improving the mental resilience of people in later life. Mental resilience in later life is connected to people living healthier longer independent lives. However, a lack of understanding of how this may be promoted and achieved has resulted in over 20% of adults aged 60 and over suffering from a mental or neurological disorder (WHO, 2017). It’s importent to explore how different socio-cultural characteristics, biographical experiences, social environments and depression and dementia impact upon the mental resilience of those in later life. Resilience and Ageing: Culture, Creativity and Community – This presentation draws from a book to be published by Policy Press (December 2018) which explores the relationship between creativity and resilience in later life. This paper uses data from a participatory theatre workshop and qualitative interviews with a range of older people to understand their conceptualisation of resilience and the strategies they have used to overcome challenges experienced throughout the life course. Professor Andrew Newman is a co-editor of this publication. In What Ways Can an Age-friendly Approach to Co-production Transfer Power to Participants? Translating Ideology into Practice – This paper examines whether the use of an age-friendly approach to co-production can be managed to ensure a wide range of older people’s views are represented and cross-sector partnerships are successfully negotiated. Queensland Ballet Prioritising Creative Health – On Sundays, at Queensland Ballet, classes for active older adults are emphasising expression, creativity and participation. A Celebration of Dance in Science, Across the Ages – Dance represents a window into health throughout the ages of life. The Performance of Ageing: An Embodied Location for the Emergence of New Knowledge – This transdisciplinary presentation draws on my current research into the performance of ageing, ageism, and their prevailing narratives of decline. 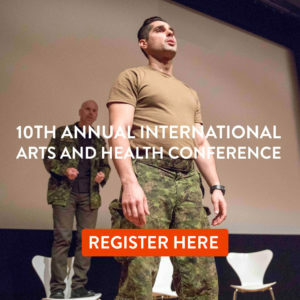 Visible Voices: Building Community Resilience through Expressive Arts in Rural Canada – This presentation will highlight two programs designed for Health Services in rural Ontario, Canada: Art-Making for the Health of It! I Shot an Arrow into the Air … AAP is a non-pharmacological intervention for groups of people with dementia utilising poetry to inspire creative self-expression, reduce social isolation, and provide social and intellectual stimulation. Since 2003, AAP has conducted poetry sessions in 32 states in the USA and 7 countries in different cultures and languages including English, German, Hmong, Polish, Korean, Japanese, Mandarin and Spanish. AAP’s observations and research report improvements in participant mood, attention, engagement and communication skills; positive impacts on the beliefs of aged care home staff and high school students trained to facilitate the poetry intervention; and changes in the narrative of how society perceives dementia from an experience defined by isolation and lost identity to one of social vitality and enduring ‘personhood’. Everyday Super Powers: Exploring Intuition in Ageing – What if quality of life could be improved, purely by harnessing the power of our natural abilities to create? Exploring the importance of new and innovative ways to support older people to live rich and full lives and training to support the aged care workforce to deliver high quality, person centred care. Creative Ageing: Evaluating Dementia-friendly, Arts-based Programs in Port Macquarie, NSW Using an Authentic Partnership Approach – Through authentic partnerships between researchers, community members and people living with dementia, we aim to create a culture change in dementia-specific care contexts, by placing people living with dementia at the centre of their care. Authentic Partnerships in Healthcare: Facilitating Creativity, Collaboration and Critical Thinking Workshop – Learn about a relationship model of care called ‘authentic partnerships’. Art and Dementia: Neuroplasticity and Contemporary Art – Can a creative art program enhance wellbeing and markers of neuroplasticity in people living with dementia? Hear about the three-year research study conducted by the Museum of Contemporary Art Australia and the Brain and Mind Centre, Sydney University and the unique approaches for engagement incorporated in the MCA’s Artful: Art and Dementia Program – Hands-on Workshop follows. Extending Arts Engagement and Reaching Out to Communities – Arts engagement has globally been shown to successful contribute to health and wellbeing. It is usually conducted in a gallery environment. The Meander Valley Festival of Creative Ageing: Connecting with Community, Changing Culture, Raising Expectations and Challenging the ‘Ageing Well’ Concept – This presentation will showcase how Creative Arts can be central in culture and care for aged care organisations as it is integral to the definition of excellence in social care and holistic wellbeing. Atrium Project– Atrium Installation is an innovative artistic project supporting CALD beliefs and identity, with ongoing benefits; boosting residents’ creativity, encouraging engagement and increasing the focus on residents’ capacities. Photovoice – A Project with Indian Women Who Are Carers and/or Have Lived Experience of Mental Illness. Along with a backdrop of 15 selected Photovoice projects and captions, this workshop will outline information about the project and stories of individual empowerment, community development as well as collaborative work. Mental Health and Women Workshop: Promoting Social and Emotional Wellbeing Through Cultural and Creative Arts – My lived experience has inspired me to use ‘Headwraps and Hoodies’ to promote and raise awareness for mental health. and photography of a healing arts session taken at dawn in the desert of Saudi Arabia. Creating Environment – This presentation will explore the relationship between art, health and the environment. During the winter of 2018 the National Gallery of Australia developed a public programs initiative focused on ‘wellness’. It started with a Toad … – The story of how Hull’s Larkin with Toads project inspired Port Macquarie’s Hello Koalas and the impact of large scale public art projects on community health and wellbeing. Art in the Trees: the Practical Application of Art in Delivering Successful Forest-based Visitor Experiences – This presentation will provide an overview of the use of visual, applied and performing arts in the creation of successful visitor destinations in NSW State Forests. Why wood is good for health, wellbeing and productivity –The use of wood in the interior of a building has clear physiological and psychological benefits that mimic the effect of spending time outside in nature. Who ordered humble pie? –Local government, not known for its focus on creativity and wellbeing, retains a strategic role in the development of regional settings. But how does a dialogue with council begin? Educating City Planners on Employing Public Art to Improve the Health of Their Community – City planners can improve community health and resident wellbeing through public art. Danielle Gullotta, Access Program Producer, Art Gallery of NSW, will present an art-making session each day with an AGNSW artist educator.